If your water heater is leaking or you run out of hot water quickly, we’ll do our best to repair it, however, you may need a new water heater installation. If so, replace it with a new high-efficiency water heater from the plumbing experts at Oliver. We have a variety of options for you including high-efficiency water heaters, electric water heaters, gas water heaters and tankless water heaters. There are many things to consider before purchasing a new water heater. We’ll help you figure out how much room you have for a water heater installation, your fuel source (most water heaters are either electric or gas and are not interchangeable), and whether you plan on installing a hot tub, spa, or jacuzzi in the future. Our HVAC company has a history unlike many others that includes church prayer meetings, the Vietnam War, Boeing’s Helicopter Division, a man named Joe, and more. 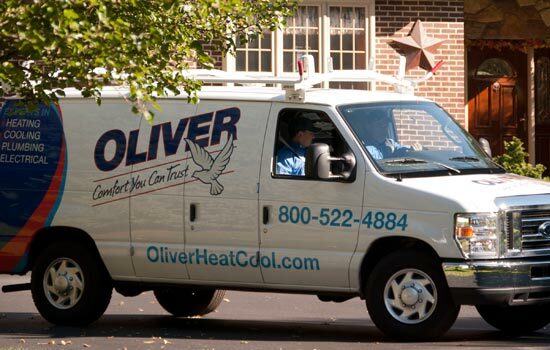 Ever wonder who’s behind the success of Oliver Heating & Cooling? Meet the professionals who keep our business running smoothly day in and day out. Check out our Projects page to see how we’ve helped residential and commercial clients stay comfortable all year in Pennsylvania, New Jersey, and Delaware. Since we began in 1971, Oliver has won many respectable awards, such as the Trane Comfort Specialist Award, Angie’s List Super Service Award, and many others. Our company is a proud member of many different local, statewide, and national associations. We love hearing what our customers have to say about our company. Read some of our reviews and help us out by leaving one of your own. You can either view our numerous televisions commercials or listen to our radio commercials from over the years. We keep you up-to-date with the latest news and events that are going on within our company and in the HVAC and plumbing industry. We love keeping our customers updated with seasonal newsletters. If you missed our latest one, feel free to download it here. The FAQ section provides homeowners with answers to some of the most common questions we hear regarding our heating, cooling, plumbing, and electrical services. Check out our blog to read the latest news about our company, articles about our industry, and tips on heating, cooling, plumbing, electrical, and more. If you’re experiencing an emergency, please contact us right away. We offer same day services and will get to your home as soon as possible.